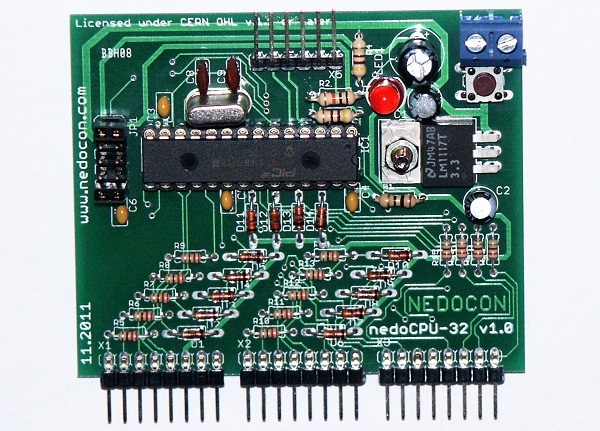 Shaos let us know that his nedoCPU-32 boards and kits are available for purchase on his site. The nedoCPU-32 is a breakout board for PIC32 microcontrollers that come in through-hole packages. His board has a built in power supply, a quartz oscillator, and a passive protection circuit on the broken out pins. We covered the development over the past month. One thing to note about his board is that all the breakout pins are setup in a “knife”. This makes it is easy to interface with all 24 pins using just one side of a standard bread-board. This entry was posted on Friday, December 16th, 2011 at 12:00 am	and is filed under kit biz. You can follow any responses to this entry through the RSS 2.0 feed. You can skip to the end and leave a response. Pinging is currently not allowed. You have to take into account that just one guy designed this, so you are paying for someones time designing this and testing this. Then, his PCB is rather awesome, and PCB’s are not cheap in small quantities. That 43$ also includes shipping, and lastly, it comes fully assembled for you. For 43$ it is not that bad at all considering all the above. It is a beautiful PCB, and it is assembled. Having just spent days designing a PCB (not cheap to make either) I have to agree with hak8or. Indeed. That’s a beautiful board. It’s amazing how simple PCB designs can become expensive when you add up what’s involved as far as parts, etc, even if you don’t account for time.